Have you ever looked at the 'Mr Men' characters and thought, what about one called Mr ??? ... 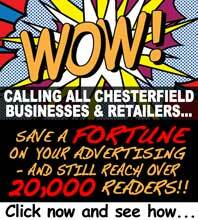 If you have, then an event in Chesterfield this Saturday could be for you. 'Mr Men' day aimed at raising cash for local charities. From 9am to 5pm, Mr Men characters will be outside the store, with Mr Men merchandise on sale along with home baked cakes, tombola and other stalls. There's also a 'design your own Mr Men' competition, with the winner announced at the end of the day.